Can't Get Married in Jeans? Amsale gowns are 10 percent off if you buy on March 20 or 21. Hint hint. In 1985, Amsale Aberra was getting married. You can imagine how hard it was for her to find a simple, classic wedding dress in 1985. And even if you can't imagine, we're going to assume you saw "The Wedding Singer." Acres of pouffy taffeta and puffy gathered sleeves were the norm. And it was NOT pretty. So Amsale did what any overly ambitious bride-to-be would do in her situation: complained to everyone in earshot and made her bridesmaids cry. No, just kidding. Instead, she filled her sketchbook with designs, found a couple of seamstresses, and ultimately started her own business out of her New York City apartment. Now the Ethiopian-born designer is renowned for her "forever modern" wedding dresses. 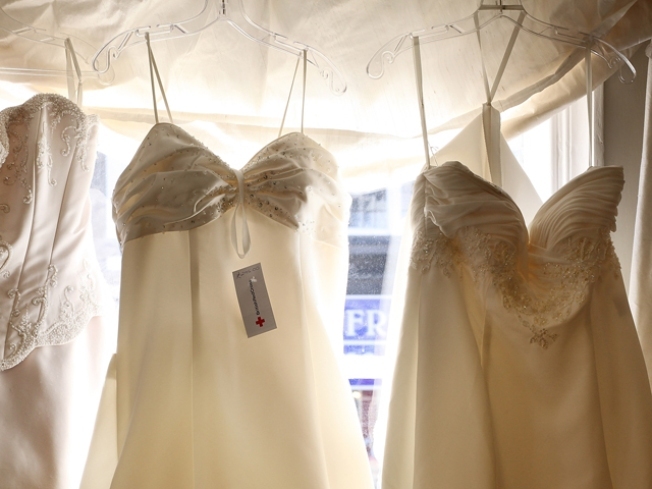 Head out to Hitched Bridal Salon (1523 Wisconsin Ave. N.W.) March 20-21 for their Amsale Bridal Trunk Show, where you can try on gowns from her newest collection and learn about the custom changes that can be made on your gown of choice. And all Amsale gowns purchased at the trunk show are 10 percent off -- and you won't ever have to think about puffy sleeves again. Call 202-333-6162 for an appointment or email appointments@hitchedsalon.com.